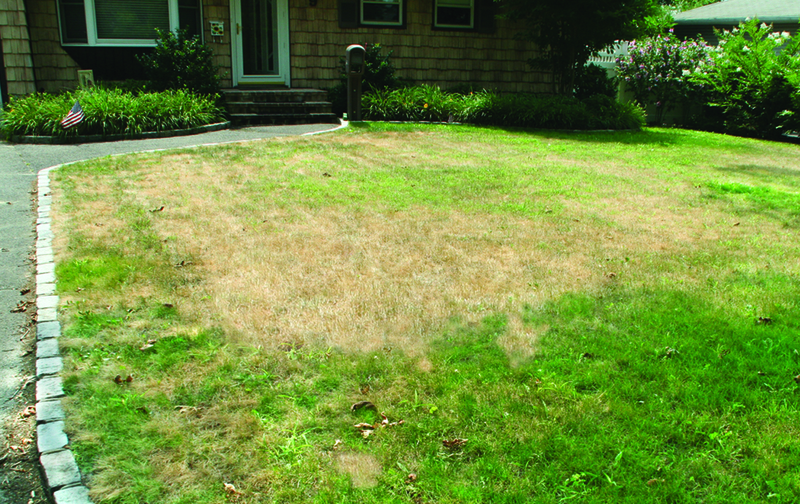 A patch of dead grass on an otherwise lush lawn can be a frustrating eyesore for homeowners. Whether lawn care is your passion or just something you do to maintain the value of your home, dead grass can be exasperating. But as unsightly as dead grass can be, addressing it and restoring the dead patches can be somewhat simple. Before you can restore grass, however, you must first identify the source of the problem. Grass often dies because of urine damage, which is typically characterized by a dead spot surrounded by otherwise green grass. Grub infestation might be at fault when dead grass appears, and such an infestation often produces patches of light brown grass that are scattered throughout the lawn. It’s also possible that dead grass is a result of human error. If your lawn was overfertilized, then patches of gray-green grass may appear. Fungal disease is another common culprit behind dead grass, and such disease can manifest itself in different ways. Once you have identified why the grass is dead, which may require the help of a professional, then you can begin to treat your lawn. Urine damage is often limited to a particular area of the grass where your family pet routinely relieves itself. Once a particular patch of grass has worn down, the pet may move on to another spot. But if you quickly notice a dead spot due to urine damage, you can train the animal to urinate elsewhere, limiting the damage it causes. When repairing the grass, dig a hole that’s roughly four inches deep and fill it with fresh soil until it’s level with the soil surrounding the dead patch. Then you can sprinkle seed on top of the freshly laid soil and water the spot.Grass should grow in and stay green so long as you prevent further urine damage. Addressing dead spots caused by insect damage can be a little more complicated, and some homeowners may prefer to hire a professional. If you want to handle the problem on your own, apply pesticide to the affected areas so the insects behind the problem are killed. Once the insects are no more, cut the grass, raking the affected area to remove the dead grass and any additional debris. Scatter grass seed over the affected areas and then apply an appropriate fertilizer and water immediately. Professionals may know just the right fertilizer for your lawn, so even if you want to go it alone, visit a local lawn care center to ask for advice about addressing your particular problem. Fertilizer damage can also prove difficult to address, as applying fresh seeds too soon can kill any freshly growing seedlings. So grass that has been damaged by over-fertilization must first be allowed to fully die. Once that has happened, the grass can be cut and any remaining debris or dead grass can be removed. Seed can then be scattered, and you can even add some additional soil before laying down an appropriate amount of fertilizer and watering the lawn immediately. If you don’t trust yourself to use fertilizer correctly, then hire a professional to do the job for you. This will cost a little more, but you likely won’t wake up to more dead patches of grass down the road. Dead grass can be unsightly and turn an otherwise lush lawn into a patchy eyesore. But addressing dead grass can be easy and can quickly restore a lawn to its green grandeur.